Not a great deal is known about Giacomo Gorzanis, though the booklet notes tell us he was the only lute composer from Apulia to have left a significant amount of work, and gives us a teasing fragment of information about the mention of a “Messer Jacomo, a blind man who played the lute” on the baptismal entry for his daughter Domenica Giacoma. He eventually settled in Trieste, where by 1567 he had received citizenship. His music survives in publications from Venice and numerous preserved manuscripts, including tablature books from which much of this programme has been taken. There are of course various courtly dances, Neapolitan lute songs songs and quite elaborate fantasias. The majority of these pieces are recorded here for the first time. 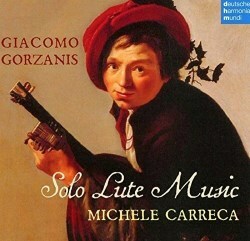 Nicely recorded, Michele Carecca performs on three different lutes here, providing some useful contrast and subtle changes of register and expressive range, as well as technique. There are a couple of less subtle changes in tuning, for instance between tracks 15 and 16 which jumps a little disconcertingly from A 440 Hz to A 453 Hz, though it’s not too hard to adjust after a moment or two. This sort of programme can, of course, feel a bit too specialised for straightforward enjoyment, but the programme mixes different styles of work nicely, and while you can let it all burble away sweetly in the background there is also much to be discovered through closer attention to Gorzanis’ elegance and inventive panache within the framework of both the instrument and the fashions of his day. This composer has appeared sporadically over the years but as far as I can see this is the first disc to be dedicated entirely to his lute pieces. As such it is a valuable artefact for collectors and players, and with Michele Carreca’s fine playing it can be safely recommended.